Can’t decide between pico and guac? Why choose? This Pico Guacamole recipe combines both pico de gallo and guacamole in one delicious appetizer recipe! You can never go wrong serving chips and guacamole as a party appetizer. 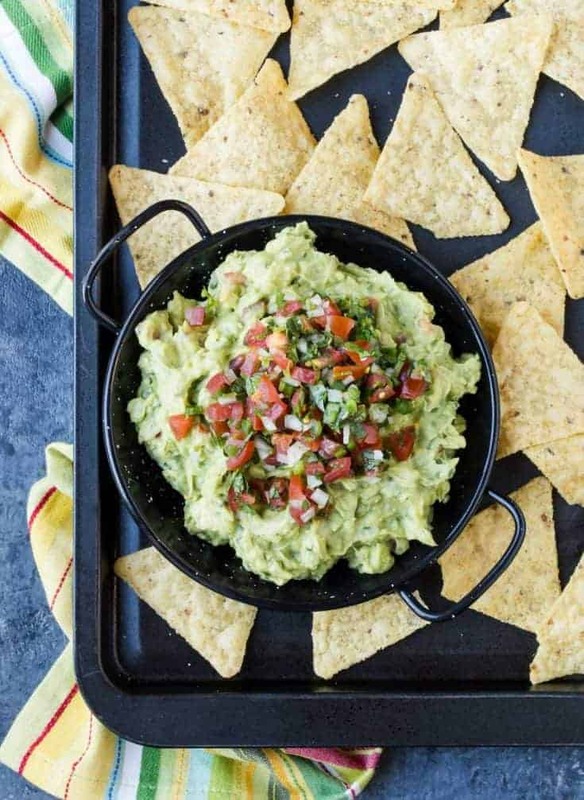 But this Pico Guacamole recipe takes a tried and true favorite (guacamole) and adds just a little bit of fresh salsa (pico de gallo) to the mix. The result is one heavenly bite that is tough to stop eating! Now I realize most everyone has their favorite style of guacamole. There are the purists who believe tomatoes have no place in guac. Me? 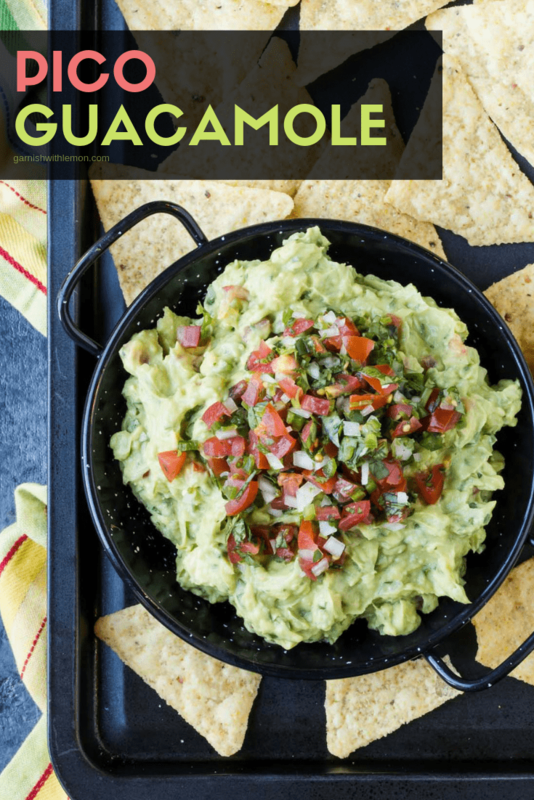 I adore chunky guacamole, which is why salsa Fresca (another name for pico de gallo) is such a perfect partner in this Pico Guacamole recipe. I like to mix half of the pico in with the guac and then pile the other half on top of the dish for some visual flair, but feel free to mix everything together if you prefer. 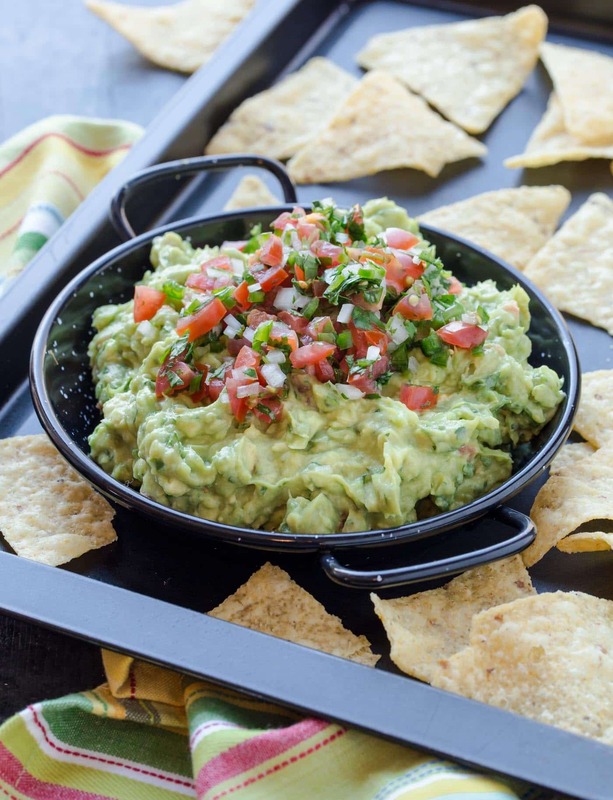 Really, there are no rules with guacamole (except no hogging the bowl). Double the batch, and you have an awesome snack to munch on while watching the big game. Have a bit left over? (Never in my house, but there are some people…) Slather it on sandwiches the next day or make avocado toast for breakfast. Just make sure to press the plastic wrap right up to the surface of the guacamole to prevent any excess air from sneaking in. Mix together onion, tomatoes, cilantro, jalapeno pepper and half of lime juice in small bowl. Set aside. In another small bowl, combine the remaining lime juice and avocados. Salt to taste. Stir in half of the pico de gallo into the avocado mixture until thoroughly combined. Top with remaining pico and serve. I hear ya there…I never want to share my gauc either! Every man for themselves! Hey, a girl can only give so much, right? I always have the internal battle at Chipotle! Sounds I get a veggie bowl so I can still get the guac without paying extra for it! I like my guacamole chunky style too! This looks great! Perfect for cinco de mayo!! I love huac in any way, shape or form! This looks amazing. I have the same pain when I go to Chipotle…especially when I know I can make a big container of it for about the same price. I love that you combined the two dips into one amazing one! Thanks, Jocelyn. It’s the best of both worlds. I like my guac chuck as well, the more stuff the better! I hate when I order and it’s basically just smashed avocados — no bruno. Love this twist on a classic! I guess I don’t fall in the purist line. In fact I very rarely to I find a guacamole that I don’t like. Some I like better, but pretty much I think of myself as an equal opportunity guacamole eater. This looks a cut above to me! Agreed; it’s hard to go wrong with guacamole. Period. I pretty much use Chipotle as an excuse to get their guac! I love it and never bat an eye at the extra dollar amount! It’s so good and so addictive! This looks amazing! I could make a meal just out of this! We are doing a guacamole roundup on Friday for Guacamole Day and wondered if we could include a link to your recipe in our post. We would also like to use your picture and will feature it with your blog’s name. Sounds great, Linda. Looking forward to seeing the post! I rarely get the guac at Chipotle as well. Now I just make my own. It’s always great to have a good guac recipe in your arsenal. This looks so refreshing.. love especially the addition of pico de gallo to the mix. Going to try this soon! Thanks, Cyrus, It’s the perfect combo! I’m with you – too cheap to buy the guacamole. Love the idea of the pico de gallo and if I’m short on time, I’ll use some pre-made high quality salsa as an add. I think I might be getting excited for Cinco de Mayo now! Love those short cuts- I do that too! We would eat well together 😉 chips and guac, for the win! How can you have “guacamole with pico” when guacamole is by definition mashed avocado with pico? Do you mean “guacamole, heavy on the tomato/onion/cilantro/etc”?